A London Marathon runner proposed to his partner moments after crossing this year’s finish line because he could not imagine ‘getting through life’ without her. 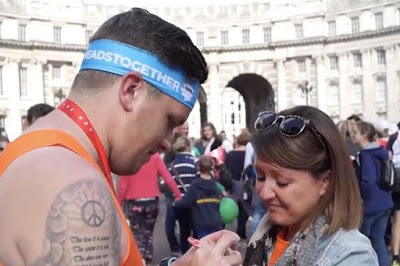 In dramatic footage, Nick Edwards, from Surrey, can be seen interrupting his post-race interview with disability charity Sense to take an engagement ring from his brother-in-law, Matthew Ling. 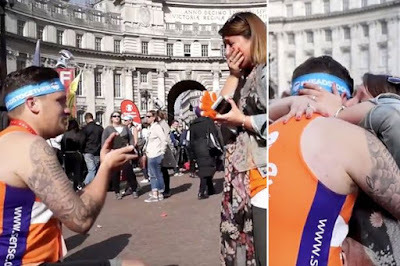 The 27-year-old then gets down on one knee to pop the question to his girlfriend, Sally Gerrish. The couple, who have been together for two years, are caught up in emotion as Nick announces: “I only got through this because I pictured you at the end. 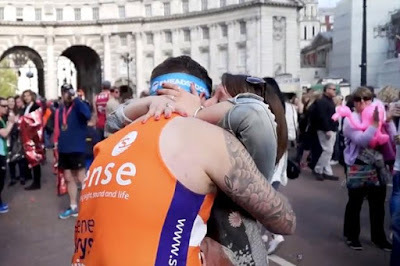 Nick has been praised by the Sense for raising over £2,000 to support children and adults who are deafblind, have sensory impairments and those with complex needs, to enjoy more independent lives.